UNB recently had two teams compete at the Northeast North America Regional Programming Contest—part of the ACM International Collegiate Programming Contest. The competition, which is attended by top performers from the Atlantic competition held in October, involved a team of three students, who have five hours and a single computer to write programs to solve as many of the contest problems as they can. Two teams represented UNB at the North American competition, one from Fredericton and one from Saint John. 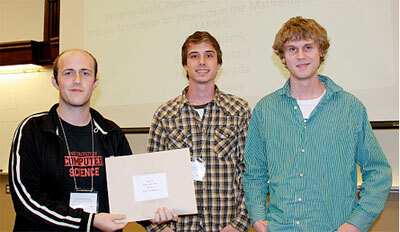 The UNB Fredericton team was able to solve four out of eight problems, placing them in seventh place. The winner, MIT, solved six of eight problems. The UNB Saint John team was able to solve one problem in this extremely competitive competition. Both the UNB teams qualified for this competition due to their performance at the Atlantic Provinces subregional competition. UNB dominated this event, with Fredericton teams placing first and third, and the Saint John team finishing second.